The perfect project for a new mom wanting to wrap her little one in yarny love! The main part of the blanket is simple garter stitch, which is welcome knitting in the middle of the night when you’re up rocking the wee one, or during the day when you’re awake but in that postpartum fog. 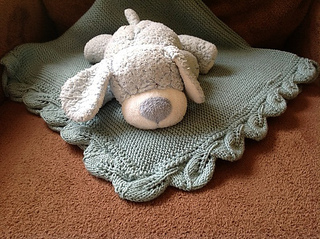 The gauge or dimensions are not critical – keep going for a larger blanket, or bind off early for a smaller carseat-sized throw. The edging is worked separately and sewn on at the end. The beauty of this approach is that all the knitting that needs concentration is done at the end, when you’ve hopefully got some energy and brain power back. 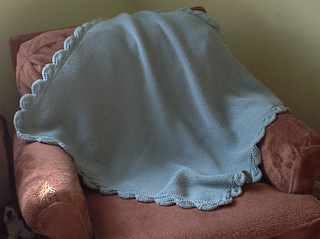 Plus, while you knit the edging, the main part of the blanket is still usable! (and my baby didn’t mind the lack of trim while we used it that way) The edging takes some focus, but because it’s less than 20 stitches across, the pattern doesn’t take long to memorize and it comes together quickly. 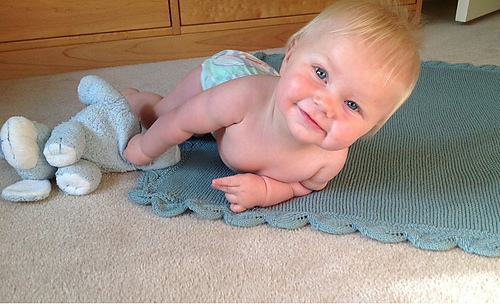 The sample is knit in a sport-weight cashmerino, but just about any baby-soft yarn would do. Use a thicker yarn to make this an even faster knit.